Jun18 by John M. Buol Jr.
Front row (from left) SSG Richard Willis, SSG Ronald Porter, CPT Samuel Freeman, MAJ Mitchell Rosnick, SFC Charles Parker, MAJ Thomas Bourne, SFC John Buol. Back row, SGM George Greene, SSG Matthew Anderson, MAJ Luis Garcia, LTC David Schultz (OIC), CSM Steven Slee (NCOIC), SFC Kristopher Beerman, MSG Robert Mango, SSG Jonathan Rosene, SSG Chris Allen. MSG Mango led with a perfect .22 Team NMC score of 300×19. 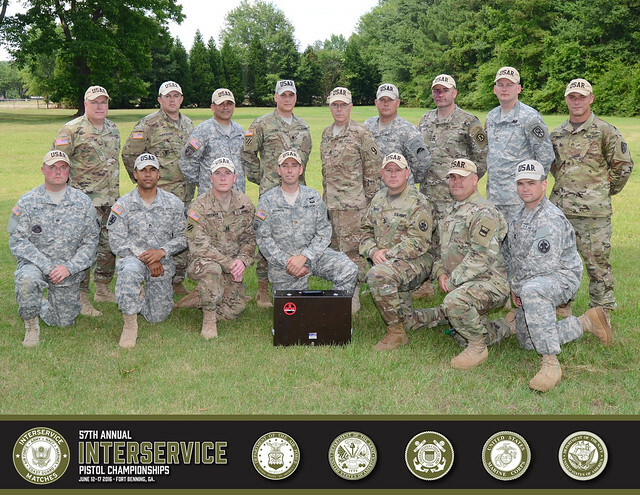 SSG Rosene was the High Army Reservist with a 3479-141 in the Overall Individual Aggregate. This entry was posted in Service Pistol and tagged FY16-summary.